Officially, the space station's longevity is tied to the life of the Zvezda service module that Russian engineers originally built for the Mir-2 station. In 2028 that module's service period will expire. Photo: International Space Station. 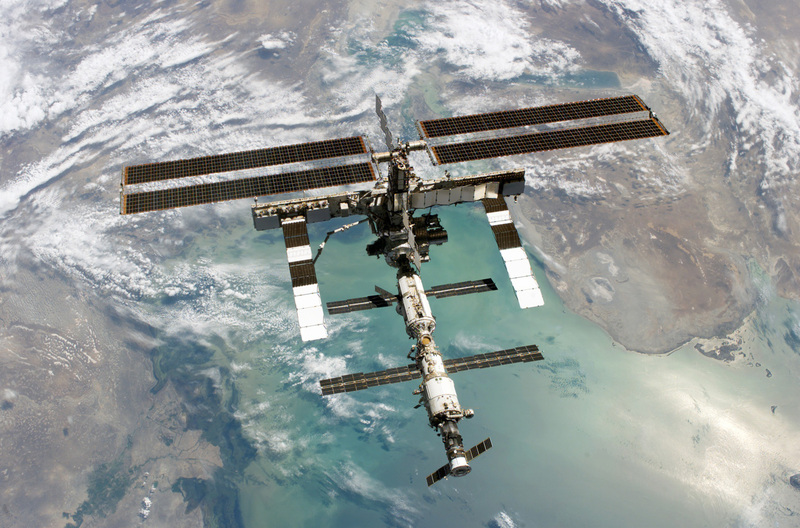 The International Space Station (ISS) often reports breakdowns, radiation damaging its hull, and the threat of malignant bacteria. Nevertheless, late last year the national participants signed an agreement to prolong the space station's work until 2024. But will the ISS survive until that year? Russian scientists say the space station is in relatively good condition, and it's even possible to continue functioning until 2028. "Something extreme must happen for the ISS to break down entirely," said Ivan Moiseev, scientific director of the Institute of Space Policy in Moscow. "Life support and other important systems can be operated manually," said Alexander Khokhlov, a scientist responsible for space instruments at the Central Scientific Research and Experimental Design Institute of Robotics and Technical Cybernetics (RTC). "Once, all the computers burned in the Russian segment, and so the crew just waited for new equipment from Earth." Economic and political factors, rather than technical ones, will be critical in determining the future of the ISS. "No single country is capable of participating in two large-scale space programs simultaneously," said Moiseev. ``The new American president will have to make a choice." NASA plans to send a spaceship to both Mars and its satellite Phobos, as well as to fly the Orion spaceship around the Moon and supply it with material from an asteroid. In addition, the Europeans, who were the first to speak about ending their participation at the ISS, are dreaming of an international base on the moon. Moiseev said the space station's frequent problems are normal. For example, about a year ago an American sensor malfunctioned, incorrectly showing an increase of hydrogen nitride. Consequently, the crew had to evacuate and move to the Russian segment for 12 hours. Genuine hydrogen nitride leaks have been frequently observed in the American segment's external thermal control system. The astronauts would have to go out into space and repair the system, replacing the broken parts. Scientists believe that even if one or two modules break down, this will not prevent the station from functioning. "The Mir module suffered a fire that melted its hull, and it also collided with the Progress spaceship," said Moiseev. ``Nevertheless, the space station continued working. If necessary, spaceships can bring needed spare parts from Earth." Khokhlov added that all ISS participating countries have made it possible for astronauts to be evacuated in case of an accident, and then later return onboard. "Prolonging the space station's life is beneficial to both Russia and the U.S.," Khokhlov said. "This would provide the chance to finish building their segments and conduct planned experiments." A multifunctional laboratory module (MLM) will be sent to the ISS in 2017-2018, which will give Russia its own space laboratory. Currently, the country's lab is situated within its residential module. Meanwhile in the U.S., the SpaceX company has built the Dragon V2 four-seat spaceship, while Boeing made the CST-100 Starliner for the ISS. The billions of dollars spent on these projects will not be recouped without prolonging the space station's life. In the future, these spaceships are expected to be used for commercial transportation. Experts say that due to the space station's wear and tear the various nations involved must cooperate closely. One national group may have a component that works better than someone else's, and vice versa. "For example, Russians have poor communications equipment, and so we often turn to the Americans to help out," mentioned Khokhlov. Officially, the space station's longevity is tied to the life of the Zvezda service module that Russian engineers originally built for the Mir-2 station. In 2028 that module's service period will expire. If the Zvezda module is rated as useless, then the entire space station will have to be terminated. In that case, just like the Mir station, the ISS will be sunk in the Pacific Ocean. If the decision is made not to sink it, then the space station will be supported artificially in orbit so that it does not fall to Earth.